Teenage son #2 had been in the hospital, weakened by a nasty virus. All the rooms were occupied, except for a bed in the children's ward. Knocked out by drugs, he was thankfully oblivious of the crying babies and whining toddlers and worried parents shuffling about. Still, the nurses were kinder and gentler, and looked into the patients more often than usual. Meals were even provided for the accompanying parent (ok, it's hospital food, but it was a considerate thought nevertheless). We're back home now, and I've had to keep him on a soft diet. After days of nothing but Creamy Scrambled Eggs, I thought of making Macaroni and Cheese. This is an adapted recipe from Gourmet magazine's 2002 edition. It's so easy, and you could use any cheese you have in your fridge. I added a bit of dijon mustard to lift the flavors, and lots of freshly ground pepper. 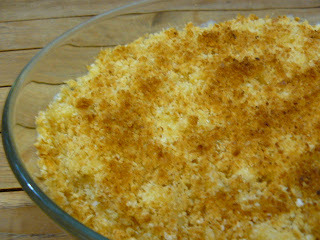 The bread crumb topping transforms this into a comforting gratin. Preheat oven to 170 deg C.
Cook macaroni in a large pot of salted boiling water until al dente. Drain and set aside. In a heavy-bottomed saucepan, bring cream and butter to a boil, then turn heat to medium-low and simmer for about 5 minutes, uncovered. Reduce heat to low, then add cheeses, mustard, salt and pepper. Mix well until cheese melts. 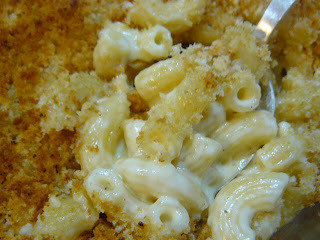 Add cooked macaroni to cheese sauce and mix thoroughly. Transfer to ovenproof dish. For the crumb topping, thoroughly mix bread crumbs, garlic and olive oil together. Sprinkle evenly on top of macaroni and cheese. Bake in oven for about 15 minutes or until crust is golden.